When plants absorb sunlight, they convert carbon dioxide into energy-rich organic compounds. What if humans could do the same thing? What if we could pull CO2 out of the air and use it to build organic molecules? This revolutionary idea is still just that — an idea. But organic chemists at UNC are laying the groundwork for turning it into reality. A graduate student sets up a light-driven reaction with an organic dye. A freshwater aquarium looks a bit like an underwater garden — bright, green grasses grow next to burgundy leaves resembling arugula. Small, silver fish dart between the foliage, as streams of bubbles flow up through the water column. Dave Nicewicz stares at this array of life contained within the rectangular glass tank on his desk. “Look at the little oxygen bubble at the edge of the leaf — that’s a good one” he says, pointing to the plant with a reddish hue. A small heat lamp mimics the sun, radiating light into the tank, while six different species of plants release oxygen. 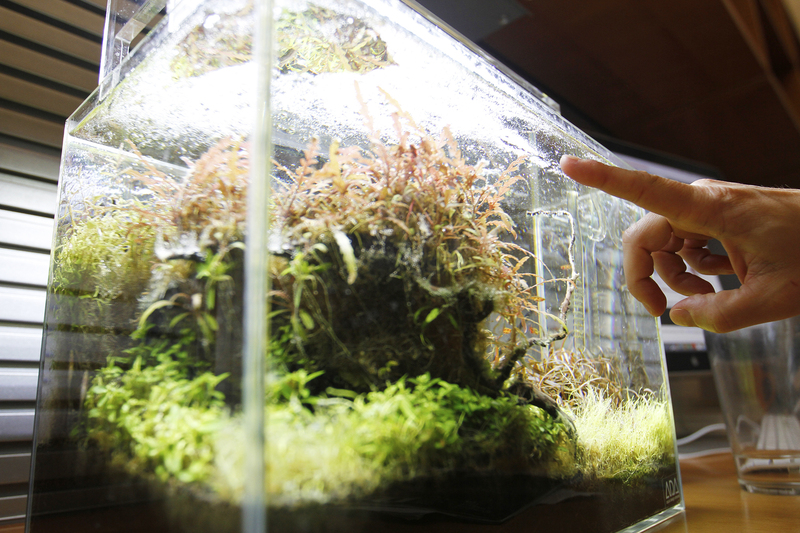 Dave Nicewicz points to the oxygen bubbles in his freshwater aquarium. As a research scientist, Nicewicz finds inspiration in photosynthesis. And while he loves plants (both his office and home are full of them) he is not a biologist — he’s an organic chemist. “I’m not equating what we do to photosynthesis, but we’re inspired by that process,” he says. Humans have not yet engineered a way to create the complex biological machinery of plant life in a lab, according to Nicewicz, but the inspiration for the starting point is there — in the form of photo-redox catalysis. “It’s just a fancy way of saying we use light to make cool molecules,” says Nate Romero, a former PhD student of the Nicewicz lab. To explain this chemical process, it’s helpful to break down each word. We’re talking about creating reactions, and all reactions require an energy input – like heat or light. Photo refers to light, and redox refers to the transfer of electrons. Catalysis simply means using a catalyst, which decreases the amount of energy needed for a reaction to occur. “We can use a single catalyst to make hundreds or thousands or millions of molecules that we’re interested in studying,” says Cole Cruz, a graduate research assistant in the lab. By trying out different catalysts, this group of organic chemists can trim off one part of a molecule, or combine molecules that wouldn’t typically combine. These “cool molecules” play a major role in the development of vital plastics and medicines around the world — making the production process more economical and more environmentally friendly. While scientists have been studying photo-chemistry over a century, photo-redox catalysis hasn’t received mainstream attention until the past decade or so. Advances in technology, especially the widespread use of LEDs, and the ability to pinpoint precise wavelengths of light, have made it more commonplace, according to Nicewicz. More accessible and less expensive than lasers, LEDs are highly useful for organic chemistry because a researcher can utilize a particular color of light in a reaction. Researchers in the Nicewicz lab need highly energetic yet tiny wavelengths of light to power their reactions. They measure those wavelengths in nanometers — or one-billionth of a meter. A sheet of paper is about 100,000 nanometers thick. A strand of human DNA is 2.5 nanometers in diameter. That precision is key for pinpointing the strongest reactions. Suppose a researcher has four components in a solution — if she uses thermal energy, then all four parts will be heated, which can lead to unwanted side reactions and wasted energy. By using light, the researcher has much more control. They’re not using plants in these reactions though. The lab uses a synthetic version of the pigments founds in plants — in the form of an organic dye. “There are some parallels to the dyes found naturally in plants, like chlorophyll, but ours are much more simplified,” Nicewicz says. When an organic molecule inside that dye absorbs light, the molecule moves into a higher energy state, transporting electrons around, and creating a more powerful reaction to fuel production. The key for researchers in the Nicewicz lab is finding the perfect combination of color and light. Organic dyes have been around for thousands of years. “Purple dye is probably one of the most prized possessions of the ancient world — that was actually an accidental discovery,” Nicewicz says. But the organic dyes that his lab produces are no accident. 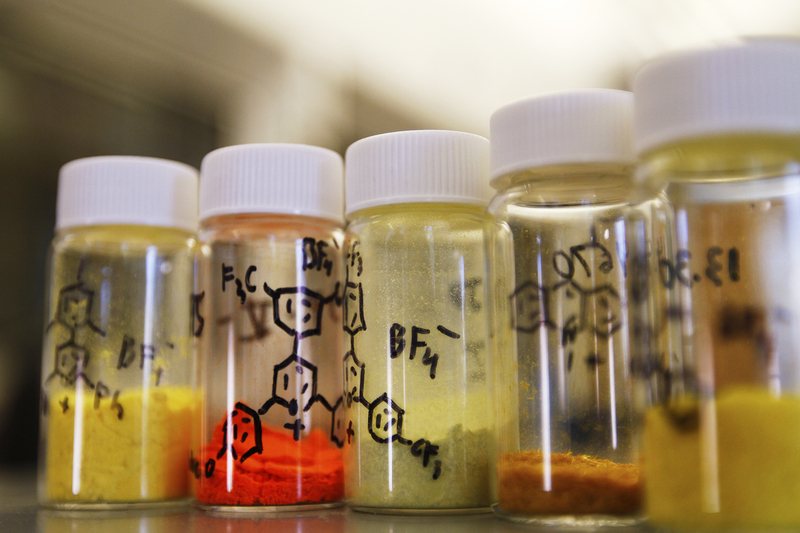 While dyes can come in many different colors, the Nicewicz lab mainly targets yellow and orange because they can absorb the highest energy light, and then put that energy to work in reactions. The dyes are easy to make using readily abundant, organic raw materials. Researchers combine extracts from essential oils — almond extract for example — with sulfuric acid in a dehydration reaction to create the powdery dye. Dyes that students have created in the lab. Nicewicz is designing a new undergraduate lab section for second-year organic chemistry students to produce libraries of these dyes. He piloted the program during the 2017 summer session, then introduced a larger-scale version during the fall semester. Another one of Nicewicz’s long-term goals is to produce all these catalysts in a reusable fashion, utilizing a flow set up with the catalyst coating the walls of a reactor. “We flow our reactants through that, the reaction happens, and then we can recycle this catalyst indefinitely,” he says. While much of their work focuses on creating new molecules, the Nicewicz lab also produces aromatic compounds. (For those outside the chemistry world, aromatic refers not just to smell but to a set of compounds with a distinctive stable structure.) The best known aromatic compound, which has a sweet, gasoline-like odor, is benzene. “Most pharmaceuticals and agro-chemicals have a benzene embedded in them somewhere,” Nicewicz says. Researchers start with the benzene core structure, and build off of that to make more complex structures. These compounds can be used to make anilines, which are used to create polyurethane coatings and medicines like Tylenol. Pharmaceutical companies often call this research “discovery” or “medicinal” chemistry to find new compounds. “They want reactions they can do really easily to make thousands of molecules and then they screen those thousands of molecules against certain disease types,” Nicewicz says. A process similar to that of Nicewicz’s students begins — build up a library of compounds, find the winners, and then keep modifying them until you find the best possible one. While photosynthesis began roughly 3 billion years ago, the planet was not covered in forests until 500 million years ago. Nicewicz hopes humans can refine a synthetic version of photosynthesis a bit faster than that. “There is so much that goes into being able to synthesize molecules in ways that are as complex as what plants do,” Nicewicz says. The work of his lab and others in the field of organic chemistry is just one part of it — we also need advances in physics, engineering, and biology. And it’s not just a matter of using sunlight. Nicewicz wants to utilize other naturally occurring energy feedstocks. Back in his office, Nicewicz envisions a future where this process could exist, and the impact it would have. Dave Nicewicz is an associate professor and director of graduate studies in the Department of Chemistry within the UNC College of Arts & Sciences. Cole Cruz is a PhD student within the Department of Chemistry and a graduate research assistant in the Nicewicz lab. Nate Romero is a former member of the Nicewicz lab and a current postdoctoral fellow in the Swager Group at MIT.